Proposed PLAN of WORK for 2011-2012 and coming year(s). Even though I could technically been away from the Institute in the Winter and Spring quarters I volunteered to stay in town instead and teach at least one course each of these quarters. The initial experience was quite disappointing. Many of the students who were enrolled (all from another major than the IPT major) were unprepared for the rigors of a technical course and complained about my teaching ÒstyleÓ to administration. I had never had such a thing happen in the past 30 years of teaching. Consequently I modified the technical content of the second course I offered in the Spring and also lowered the technical rigor and demands of my Fall 110-11 courses. In spite of this the grade distribution still indicates that the students overall are less technically proficient than in past years. To document my teaching "style" in case anyone would want to review how I run at least the lecture portion of my classes I video taped just about all my lectures in the High Speed Photography course this pastFall and put these on Youtube. This was actually done more in order to help students review concepts covered in the lectures in case some point was not clear or if for some reason they had to be absent during a particular lecture. This was received well by the class. 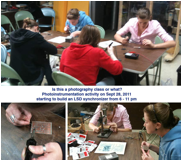 These are a couple of candid photos from my Photoinstrumentation class and the High Speed Photography class. On reviewing the student feedback/evaluations using the RIT computerized teachaer evaluation system the response from students this Fall was about the same as it has been fo many years. On this point however, in my opinion evaluations that students might provide after they have been away from the school and are working in industry are a much better way to collect feedback and learn from than those filled out in class when the students don't really have a good idea of how the course contents impacts on-the-job. As in past years, in addition to the evaluations available through the RIT system, I have continued to encourage my students to use a web-based evaluation service at http://www.ratemyprofessors.com/. I donÕt know what my current ÒratingsÓ are there but I seem to be doing OK in terms of level of difficulty, helpfulness and overall quality. My perception from these various methods of gathering feedback is that students generally find me knowledgeable, approachable and helpful but sometimes lacking in apparent organization. I am a strong believer in having students learn by Òfinding outÓ answers to problems rather then spoon feeding them with directions. 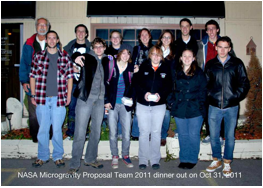 On Halloween 2011 (Oct. 31) I took the team that prepared a proposal for NASA JSC's Undergraduate Microgravity Flight Opportunity out for dinner at Michelina's down West Henrietta Road. Several Italian selection entrees and salad and drink plus animated conversation. 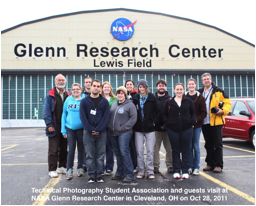 I organized for the Technical Photography Student Association a club field trip to NASA Glenn Research Center located in Cleveland, Ohio. The visit took place on October 28 and the group was comprised of Tech and Biomed students. From all reports they had an enjoyable and informative experience. Their trip was listed in Club News, a publication of the SAU Clubs organization. I attended all but one meeting of the Technical PhotographyStudent Association last year. In the photo at left was a picnic at Charlotte Beach planned by the group. For next year my plan of work vis-ˆ-vis teaching and advising is to: Offer the same courses as I did this past year. It is sad to see that technical content such as available in my Photoinstrumentation course sequences is not probably going to continue to be available to the students due to perceived Òlack of interestÓ. This course provides students who elect to participate in them a diverse and unique opportunity to experience content not available in any other photo program either at RIT or nationally. It is certinaly not for the faint hearted. But neither are the Marines. I had planned to become more engaged with time lapse photography and expand on my personal efforts to produce more polished results than what I had been able to produce in the past. To this end I volunteeeed to produce a time lape record of the Institute Hall being build on the west side of the IT campus. The project has been underway now for three months and in spite of several small glitches the process is going well with over 10,000 frames having been recorded so far. The camera system is shown installed in the photograph at left. Work started in September and I visit the set-up at least twice a week. I have maintained an acrtive presence with the OSA, the SPIE and OSA. I participated in several of their conferences and have been in the process of reorganizing the SPIE Student Chapter of which I am the advisor. The SPIE Student Chapter membership is primarily from the Micro Electronics Engineering program and after consultation with SPIE officials in Bellngham we have come to the conclusion that it is probably best to transfer the Chapter to the MicroE department. I look after a global Hispanic communications exchange group (Fotored) whose main topic of conversation in Spanish relates to photography but which often strays into such topics as cooking recipes, fine wines, seamanship, etc. Over the Spring I organized an exhibition of 29 of the list's member's photographs. This exhibit is slated to travel the world. This is a link to the exhibition I organized for the members of the mail list (a spanish speaking list devoted mainly to photography The exhibition itself is comprised of 48 16x20 prints and they are destined to travel worldwide. I continued my activity in the area of exhibiting my photographic work and this resulted in a one person exhibition at NASA Glenn Research center. I was accepted and had a photograph entitled ÒString VibrationsÓ exhibited at the Bridges Joint Mathematical Meetings conference and Art in Mathematics exhibition that took place in New Orleans in January 2011. My photographs have been published in several textbooks and been included in several doctoral thesis around the world. I organizad an exhibition of photographs by Hispanic photographers from around the world and presented the exhibition in the RIT SPAS 2nd floor hallway display cases from June 10 -25, 2011. SHOTS - a 2011 calendar of high speed ballistic photographs. FOTORED EXPO II – the catalog of the Fotored memberÕs exhibition that took place in SPAS from June 10 -25, 2011 in the 2nd floor north display cases. ANNUAL SPAS FACULTY EXHIBITION - this is a record of the annual SPAS exhibition by members of the faculty of the School of Photo Arts and Sciences. This was the third year that I prepared this catalogue and made sure that a copy was included in the RIT archives as a permanent record of the accomplishments of SPAS faculty. Got a request for a "string" photo for the cover of a book cover entitled ÒSenses of VibrationÓ and a schlieren photo of goblets with hot and cold water for a book called the "John Zink Combustion Handbook". I presented at the Seminar on High Speed Photography organized by the Visual Instrumentation Corporation in Lancaster, CA in November 2011 on the topic of Applied Streak and Strip Analog and Digital Imaging. This was to a group of about 20 government technical photographers. It is generally known that the acceleration due to gravity has some value and velocity from rest depends on it but how to prove it? Here is a relatively simple photographic way to do it. Added in September 2011. This is a "by the numbers" set of instructions on how to determine not only whole f numbers but also "in between" ones to allow a desired increase in light level at the image plane. Added in January 2011. This is a sample exam that anyone may copy and use at their discretion covering introductory topics in shutter calibration, velocity and rotation rate measurements, electronic flash concepts and introductory time lapse and high speed imaging matters. Added in January 2011. Written as a lecture note review this is an overview of certain aspects of setting up for time lapse and high speed recording situations. Mostly on Time Magnification, use of intervalometers and determination of framing rate and related issues. Added in December 2010. In addition the article on Proving Newton right or wrong was accepted for publication by Tech Directions magazine This was accepted in October but has not yet been published. For next year I hope I can come uo with more ÒnovelÓ ideas and applciations to present online or in print. I plan on devoting myself to teaching my traditional courses and developing more experiments suitable for incorporation into the curriculum, especially in the area of special effects. This course was designed primarily as an "analog" or at least Òin cameraÓ based course since special effects can often be easily accomplished in the "digital" realm. My publishing output through Lulu.com was a bit less than in past years and I am planning to complete two or three new titles over the coming year. I will continue to promote and send my traveling exhibits of technical photographs to more schools nationwide. This will the fourth year of this activity and the response from the host schools has always been quite positive. As far as I know this is the only example of photographic work produced in SPAS that is being exhibited in high schools and colleges in the US and Canada. I also plan on revisiting the Visual Instrumentation Seminar in California next November and will continue to assist a faculty member at Arizona State University where she is implementing an Imaging Technology program to service the military ranges in that neighborhood. I will participate in several exhibitions including the WPPD worldwide exhibition to take place in late April and the Bridges JMM Art in Math exhibition in January 2012. There is a art community center in Seattle by the name of Coyote. They have an annual auction style fundraiser. I have been a contributor for the last 4 years (with "distinction" of being the author sending prints from the farthest location!) and these are photographs that left for them this year. 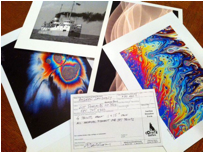 On the left is an announcement I posted on a teachers mail list offering my photographs for exhibition – free. The second photo shows the exhibits being shipped out. The third set of 12 photographs was returned from Dallas and the teacher there sent me these "environmental" photos (third composite image) as proof of their use in her class. She asked the students to identify the photographs from the set of captions that I provided. Another set came back from Pennsylvania and the teacher there said: Hi Andy! I sent back the photos... I'm hoping you got them. Just a couple days after I took them down, two of the science teachers asked where they were... They were using them as references to curriculum. Very Neat that they had a teaching aspect and an effect on the school. If the opportunity again presents itself I will give a lecture/demonstration in the High Speed Photography Lab to a group of about visiting Cleveland Community College students and their faculty. I organized the return of the Nikon Small World exhibition back to the School of Photographic Arts and Sciences for the 20th year. This collection of photographs is generously sent to us by the Nikon Corporation and is available to us for a whole year and displayed on the walls of the Dr. Ron Francis Photographic Chemistry lab. During the course of last year, acting on the basis that I was on sabbatical and thus not a full-time faculty member, TPSA, which I founded along with Don McClenny and Howard Slater (students) in 1987 unbeknownst to me came under the leadership of a second advisor. The club also decided to separate from the SPIE Student Chapter which I also founded in late 1990s. All this created a situation that was quite stressful to the students. At this time I do not know if I have any role to play with the TPSA club but I assume not. I was selected to be one of three judges for an issue of Photographers Forum magazine and made selections from over 500 photographs entered in their contest. I am a member and Fellow of the International Society for Optical Engineering's Edgerton Award Committee as well as the overall Awards Committee. I am the Internet liaison for The Photographic Historical Society and maintain for them an Internet presence off my website. I will be helping them transition (move) this website that has been provided to them as a community service for a number of years to an external site. Alumni Contacts: I plan to curtail my activities in regard to communications with alumni of the IPT program as there are more informed and capable faculty to handle such things. I plan on discontinuing the Photographic History (PhotoHist) mail list which I started in the late 1990s as the competition from the Yahoo! PhotoHistory group is just too overwhelming to keep this small list alive. I offered to send sets of my Phoenix Process figure postcards to anyone who asked for them. This is a record of the latest mailing to people requesting these. I could not photograph the envelopes going out this time because I had already handed them to the PO clerk and she would not return them for a photo! So this is the PO receipt! Destination to 27 recipients including New Zealand and Ireland plus many US states! And there were two additional mailings albeit smaller in number before and after this set was sent out. I have a couple of small exhibitions of my technical photographs on exhibit around RIT, one in a conference room in the College of Science and the other one in the B&L building. I plan to continue to install new images there during the coming year. I plan on giving a lecture/demo at Lafayette University in Lafayette, PA during the Spring quarter of 2011-21 at the invitation of Jenn Stroud Rossmann, Ph.D., professor of fluid mechanics. Tis was scheduled for this past Fall but scheduling conflicts interfered. I will continue to manage the PhotoForum mail list on the Internet (going on the 18th year for the list and the 16th for the gallery) and besides dealing with day to day issues related to smooth operation of the list itself, This list serves over 500 photographers worldwide. I am "proud" to say that I have for one more year installed a brand new gallery of list member's images on the web every Saturday morning of the year. I have been doing this actually since 1996 without anyone here in SPAS really knowing anything about it. I entered several exhibition and contest opportunities that came along during the past year. Notably the Royal Photo SocietyÕs scientific photography exhibition and the Optical Society of America photography contest. I did not fare well in either event. But I will keep trying.